The 2016 Call for Collaboration Projects, which was pre-announced last week, has been postponed, due to BAC management changes. 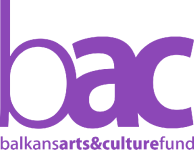 Balkans Arts and Culture Fund (BAC) pre-announces the upcoming annual 2016 call for Collaboration Projects in Arts and Culture - COLABs, that will be published on the fund's website, Facebook page and newsletter by May 3rd. Please visit our website in the first week of May for more. The application submission period will last 6 weeks and will end on June 15th, 2016. Expected start of the supported projects is end of 2016 (November-December). Together with the call, the new application form and the updated guidelines (possibly allowing for collaboration projects in only one focus country /previously was at least in two of the following BAC focus countries: Albania, Bosnia and Herzegovina, Kosovo, Macedonia, Montenegro and Serbia/; projects strengthening interdisciplinary and cross-sector cooperation) will also be published and available for download here on the fund's website. Considering the shorter application period we urge potential applicants to start seeking partners and developing project ideas early. BAC is aimed towards fostering inclusive, democratic, and prosperous societies in the Western Balkans by strengthening the cultural sector, and encouraging regional collaboration and integration. In this context, BAC aims to advance the independent cultural scene in the region by supporting authentic cultural production, encouraging participation, and raising capacities of cultural actors. Production projects (PROPs) are short-term and/or one-off events which increase the cultural offer and strengthen critical thinking, constructive dialogue and cultural exchange. PROPs are innovative, original and socially relevant, intended with the purpose of increasing artistic/activist creation, mobility of ideas, and exchanges/networking between artists and communities. This instrument especially targets emerging artists with innovative initiatives. PROPs can be developed in any contemporary art field and can take various forms (e.g. exhibitions, performances, round tables, street actions or campaigns, festivals, concerts, publications, etc.). PROPs can be of local, national and regional nature. A PROP project must be implemented by applicant from any of the eligible countries in the country of the applicant's origin, and may also include some events in other countries of the region or the wider Europe. Submission: duly completed project idea form should be submitted through our website at the PROPs Submission page, at least three months before the planned beginning of the project. Submissions in incorrect form, late or incomplete, and any additional material will not be considered. Selection: In 2016 the selection will be made on monthly basis or until the planned annual budget for PROPs is allocated in total. Grant amount and duration: Maximum grant amount available per project is 5’000 Euros. Envisaged project duration is up to 6 months. Deadline for applying December 2nd, 2015. The selected projects will be further assisted in developing the final project proposals, and are expected to start with realization in summer. As of Monday, September 7th, 2015 the 2015 Call for Collaboration Projects - COLABs has been closed. We thank everyone who have submitted their project ideas. We have received 53 submissions. The list of the pre-selected project ideas for the second round of review will be published here by the end of September. Only the pre-selected applicants will be informed by email.